I bought the 4 fan version and also bought the 88 degree thermostat for powering up automatically. Let me not mince words; I LOVE this fan system. Heavy gauge metal that looks very nice atop my HCA, and because the power supply allows for settings from 3vdc to 12vdc, you can pick the best setting for cooling vs noise level. I found the 6 or 7.5v setting works best for me, with an open rack, which I sit about 9 feet from. SILENT. Absolute silence. NO vibration (rubber feet), and no other extraneous noises. My amp has been on for about 4hrs now, and the front face plate is Cool ---yeah, I said Parasound and cool in the same sentence. Short story, long, this fan system is a bit expensive--but well worth it. I'm sure you $600 cable nerds can scratch together $240+. It's nice to run into the rare good looking, excellent performing, very robustly built, fairly priced audio accessory. I highly recommend it---even if you're not having shut down issues. This pup could add many years to your hot-running power amps' life. The units use heavy gauge metal, so you can place your amp on top of it as well. They're also rack mountable and come with rack ears. My unit performed beautifully yesterday. Had the system on all day, and the amp front and sides remained cool to the touch; then after shutdown the fans ran for about 10mins and automatically shut off. Looks real nice @steveinaz . I'd also suggest as a cheaper option the kits from Coolerguys. This assumes your not planning on stacking anything on top of it as its not meant for that. They have kits that are temp controlled as well or just always on. Pretty neat units and under 100 too. I'm just too cheap and am going to keep using laptop coolers since I just need it to pull air from the top and wont be stacking anything on top of them so they work decent enough and run 20 bucks a pop. However your solution looks MUCH BETTER. I considered Coolerguys, but their chasis wasn't near the build quality and reminded me of the "Cool-It" unit I had years ago. Was it cheaper? yep; but I went down that road before. Agree totally. If your hiding it between components in a closed rack it probably "should" do fine. But I do agree your unit looks MUCH BETTER than theirs. If I did anything I'd buy their chassis and 12v adapter for the fan and then my own fans. Been using this for a week now, and couldn't be happier. The amp stays cool to the touch, the fans are silent (@6vdc setting), and it switches on and off as it should. Finally, an audio accessory that has been "thought through" all the way. They also sell a temperature control "console" that will let you set specific on/off temps, fan speeds, etc. The simpler (read that: cheaper) thermostat probe works fine for me. I need something like this. Thanks for posting. I like that it exhausts to the front where the warm air can dissipate into the room instead of gathering and building up behind. Wanted to bump a old thread because I found a cheaper alternative that "might" work as good or better. Nice, Dan. This is something I've wanted to implement for a while, too, after Steve posted about it, but I just couldn't quite get there. Ideally, I'd like to be able to vent forward. 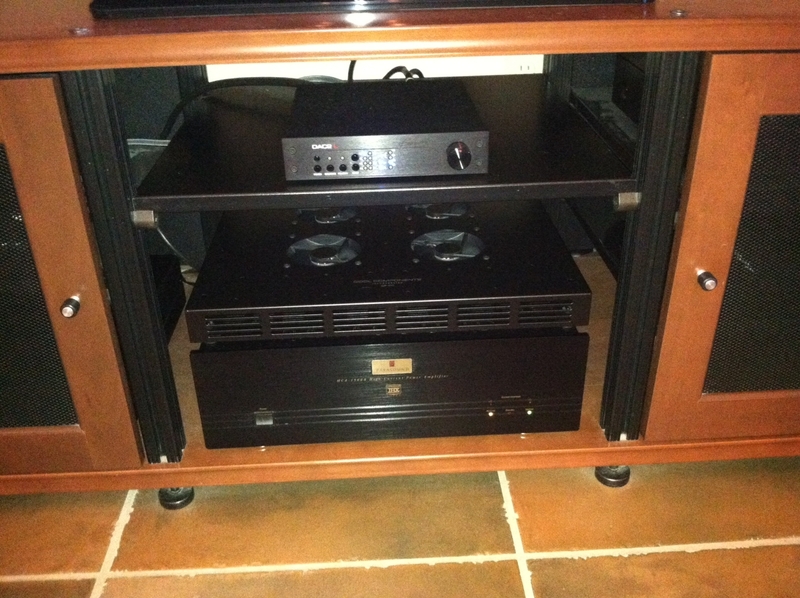 And if nothing else just let it vent up and hit the top of the entertainment center. The cabinet I'd like to use has a closed back, and not much top clearance for where the components would sit, so rear or top venting options seem like they'd just be circulating hot air instead of drawing in cool and properly exhausting it. In a more open rack idea I'm considering, rear exhaust would be fine. Forward exhausting was one of the options I liked about the ones Steve reviewed. I suppose another option with the AIRCOM would be to install their aux fans in the back of the cabinet. hehe, that thought did occur to me!